Summary: The judiciary is the system of courts that interprets and applies the law in the name of the state. The judiciary also provides a mechanism for the resolution of disputes. Under the doctrine of the separation of powers, the judiciary generally does not make law (that is, in a plenary fashion, which is the responsibility of the legislature), or enforce law (which is the responsibility of the executive), but rather interprets law and applies it to the facts of each case. This branch of government is often tasked with ensuring equal justice under law. It consists of a court of final appeal (the "supreme court"), together with lower courts. 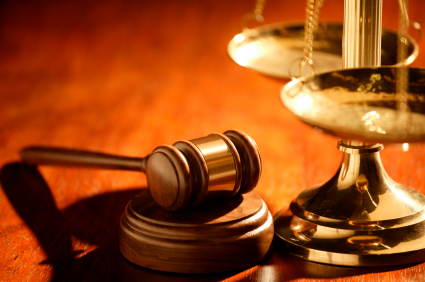 The Judicial Process in America mainly circulates around the adversary system. An adversary system is a judicial system in which the court of law is a neutral arena where two parties argue their differences. In America Judges play a major role in society. Congress establishes and receives federal court’s jurisdiction, which decides the constitutional division of responsibilities among federal and state courts. Federal judges are bound by procedural requirements, including stare decisis which is the rule of precedent, whereby a rule or law contained in a judicial decision is commonly viewed as binding on judges. The judges can also choose what they feel is right. On the other hand the Supreme Court has almost the ultimate say over cases that it chooses to review. 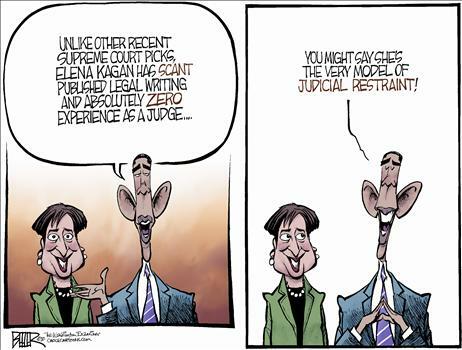 The justices dispose of thousands of cases but many of the cases are hardly approved. The judges have to be independent and fair dispensers of justice with their vital role as interpreters of the Constitution. The significant role that courts play and the power of judicial review is a complex problem in out democracy. Judges are giving a very big responsibility in our society, and by this there have been many concerns because of the way that they interpret the Constitution. They believe that if people do not feel fit for the job to step down. Partisanship and ideology are important factors in this chapter because they ensure the linkage between the courts and the rest of the political system so people views are reflected in courts. In recent years candidates for presidency and senate have made judicial appointments an issue in their election campaigns. Sentence: After judicial review, the Supreme Court found the amendment unconstitutional. 2. Adversary System: A judicial system in which the court of law is a neutral arena where two parties argue their differences. 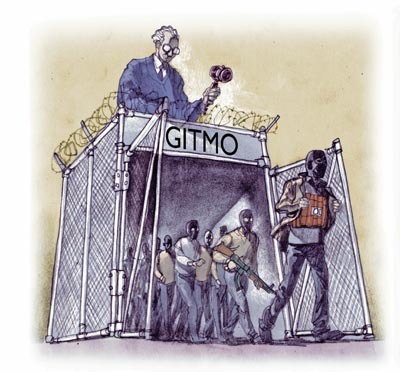 Sentence: The adversary system imposes restraints on the exercise and scope of judicial power. 3. Criminal Law: A law that defines crimes against the public order. Sentence: The court handles many kinds of legal disputes, but the most common are criminal law. Sentence: One of the most common disputes that the courts handle are cases concerning civil law. 5. Justiciable Dispute: A dispute growing out of an actual case or controversy and that is capable of settlement by legal methods. Sentence: Judges decide only justiciable disputes. 6. Defendant: In a criminal action, the person or party accused of an offense. Sentence: The jury found the defendant guilty. 7. Plea Bargain: Agreement between a prosecutor and a defendant that the defendant will plead guilty to a lesser offense to avoid having to stand trial for a more serious offense. Sentence: The defendant agreed to a plea bargain because he knew he would lose the trial. 8. Public Defender System: Arrangement whereby public officials are hired to provide legal assistance to people accused of crimes who are unable to hire their own attorneys. Sentence: The Public Defender System provides lawyers to any defendant who needs one, and is supervised by the federal judiciary to assure that the public defenders are qualified for their jobs. Sentence: The Supreme Court has original jurisdiction in cases that affect ambassadors. 10. 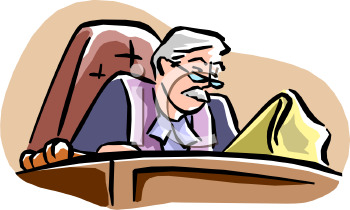 Appellate Jurisdiction: The authority of a court to review decisions made by lower courts. Sentence: Most appellate jurisdiction is legislatively created, and may consist of appeals by leave of the appellate court or by right. 11. Court of Appeals: A court with appellate jurisdiction that hears appeals from the decisions of lower courts. Sentence: All the district court decisions that are appealed are review by federal courts of appeals. 12. Precedent: A decision made by a higher court such as a circuit court of appeals or the Supreme Court that is binding on all other federal courts. Sentence: Judges in the federal courts of appeals are bound by precedents. 13. 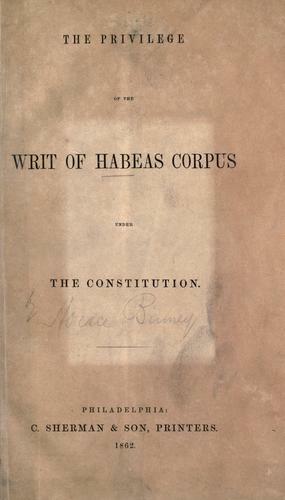 Writ of Habeas Corpus: A court order requiring explanation to a judge why a prisoner is being held in custody. Sentence: Federal courts have writ of habeas corpus jurisdiction and may review criminal convictions in state courts if they believe that an accused person's federal, constitutional, and legal rights have been violated. 14. Senatorial Courtesy: Presidential custom of submitting the names of prospective appointees for approval to senators from the states in which the appointees are to work. Sentence: Before the White House submits nominees' names to the Senate for confirmation, it observes the practice of senatorial courtesy. 15. Judicial Restraint: Philosophy proposing that judges should interpret the Constitution to reflect what the framers intended and what its words literally say. Sentence: Before 1937, judicial restraint was the battle cry of liberals who objected the judges' interpreting the due process clauses of the Fifth and Fourteenth Amendments to strike down many laws passed to protect labor and women and to keep the national and state governments from regulating the economy. 16. Judicial Activism: Philosophy proposing that judges should interpret the Constitution to reflect current conditions and values. Sentence: Some conservatives, for example, favor judicial activism because they want current judges to reverse the last half-century of precedents on civil rights and to protect property rights from government regulation. 17. Stare Decisis: The rule of precedent, whereby a rule or law contained in a judicial decision is commonly viewed as binding on judges whenever the same question is presented. Sentence: Stare decisis pervades our judicial system and promotes certainty, uniformity, and stability in the law. 18. Writ of Certiorari: A formal writ used to bring a case before the Supreme Court. Sentence: Today, almost all appeals come to the Court by means of a writ of certiorari. 19.Docket: The list of potential cases that reach the Supreme Court. Sentence: The docket has grown significantly since the 1970s as more Americans have brought more lawsuits, states have imposed more death sentences, federal regulation has increased, and federal punishment for crimes has become more severe. 20. Amicus Curiae Brief: Literally, a “Friend of the court” brief, filed by an individual or organization to present arguments in addition to those presented by the immediate parties to case. Sentence: The solicitor general also files amicus curiae briefs in cases in which the federal government is not a party. 21. Opinion of the Courts: An Explanation of a Decision of the Supreme Court or any other appellate court. Sentence: Opinions of the Courts generally state the facts, present the issues, and explain the reasoning of the Court. 22. 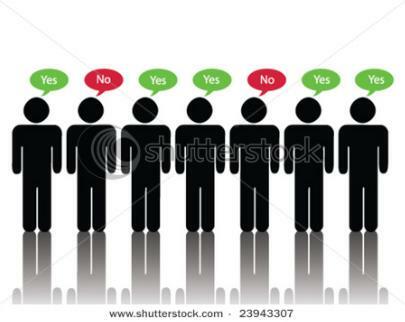 Dissenting Opinion: An opinion disagreeing with the majority in a Supreme Court ruling. Sentence: Dissenting opinions are, in Chief Justice Charles Evan Hughes's words, "an appeal to the brooding spirit of the law, to the intelligence of a later day." 23. 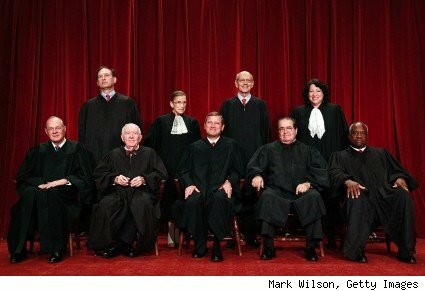 Concurring Opinion: An opinion that agrees with the majority in a Supreme Court ruling but differs on the reasoning. Sentence: Chief Justice Warren E. Burger, also deceased, wrote the concurring opinion in that 8-1 high court ruling. 6. The authority of a court to review decisions made by lower courts. 7. 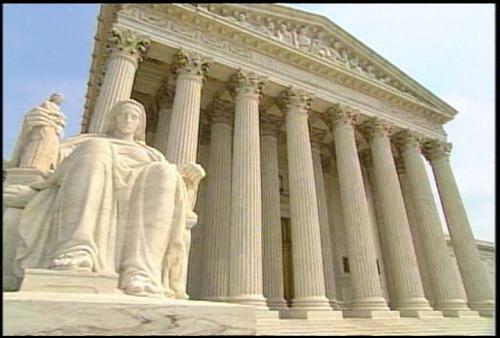 The list of potential cases that reach the Supreme Court. 8. A law that defines crimes against the public order. 2. A decision made by a higher court such as a circuit court of appeals or the Supreme Court that is binding on all other federal courts. 3. A court order requiring explanation to a judge why a prisoner is being held in custody. 4. Philosophy proposing that judges should interpret the Constitution to reflect current conditions and values. 5. Philosophy proposing that judges should interpret the Constitution to reflect what the framers intended and what its words literally say.